I was hired to help an organization that did manufacturing consulting get more business. It was just after the recession of the early 90's, and many of the consultants had lost their jobs with aerospace companies. They were wandering the halls worrying about being laid-off again because this company did not have enough work to go around. I was introduced to the person that was doing the sales for this organization. I could see one of the problems - he did not seem to know how to sell. He had a box of leads on the shelf that was labeled Dead leads. I asked him to tell me what a dead lead is. He said it's a lead where the prospect is not very interested. While I could fault this poor guy, I knew that so many sales trainers teach people to qualify their leads. They use the word "qualify" as a euphemism for discarding leads that are unworthy of further attention. Because I know the value that could be hidden in these leads, I train sales people to categorize rather than qualify leads. If they do, they have the opportunity to mine the considerable value often hidden in them. Cool for the least interested (notice I don't say "cold" since that is equivalent to "dead"). While sales trainers teach you to discard the "C" leads, it is useful to understand some of the many reasons why you shouldn't. As good sales people know, when you categorize leads, you are often guessing at the degree of interest. According to some statistics, roughly 85% of sales people will typically discard leads if there is no response after three follow-up contacts. According to a McGraw-Hill study it takes 4.3 contacts to close a sale. Since you cannot make a fraction of a contact, the actual number is 5 contacts. As you can see, most people that call themselves sales people will not even get to that point. Here are four reasons not to discard "C" leads. Good sales people can move them up to a higher category. When you make a judgment as to the degree of interest, it is a guesstimate. If you know how to sell, you can take a prospect at whatever degree of interest and move them up to a higher level. 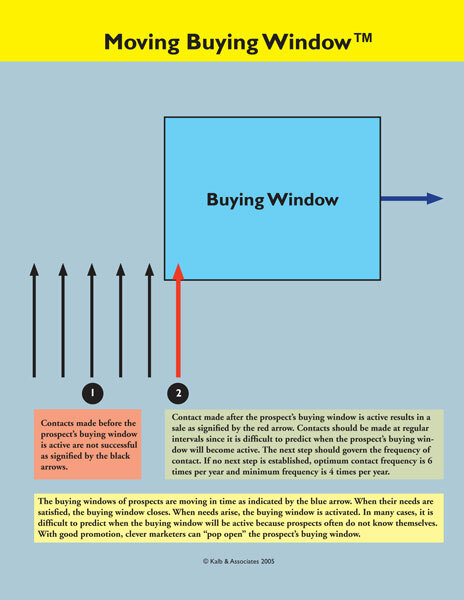 When prospect's are interested in buying a product, their buying window opens. Since it is nearly impossible for you, or even they, to predict when they will be ready to buy, you need to make multiple contacts to be sure to contact them when their buying window is open. As discussed above, too many sales people will stop contacting a prospect after two or three unreturned contacts. They don't understand that buying windows open and close and move in time. Sales Army.™ Good sales people look at every contact as either a potential customer or a referral source. Even if "C" leads never buy from you, if you develop relationships with those leads, they will refer others they know that might be interested in buying. Database value. Leads might be "C" leads to you and "H" leads to someone else. In any case, every lead in your database has value, and there are companies that are willing to rent your database. Databases are rented on the open market for a wide range of CPM's. According to Worldata Reseach's List Price Index, the average CPM for an email list is $120. When a client wanted to rent a mailing list of subscribers to AOL years ago, the CPM was $106. A one time rental of this database would bring in $6 million in revenue! Even though these values fluctuate over time, each lead in your database has a definite value. Why would anyone in their right mind discard it? Capture every contact. Every contact that expresses an interest in your products should be captured on a "lead card" record in your database. Follow up. You should follow up each lead according to the degree of interest (Hot first, followed by Warm, and Cool when you have time). Frequencies. 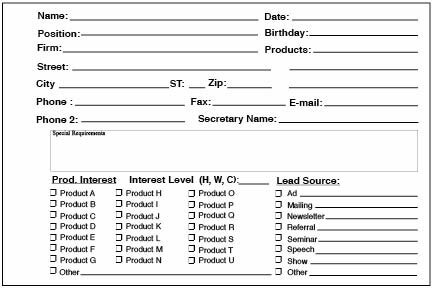 If you have an active interested lead (Hot or Warm), you should follow up according to the next step on your lead card. For Cool leads and existing customers, the minimum follow frequency is 4 times per year (every third month). The optimum follow up frequency is 6 times per year or (every other month). Potential sale or referral. Every lead record is either a potential sale or a referral source. I have so many stories where "C" leads turned into "H" leads and large customer purchases with their own referral pyramids. I have so many others where "C" leads never bought from me, but referred others. This is how to play the sales game and win. There is gold in all of your leads. Mine the leads for gold. Don't throw them away. Best of luck.